If you aren’t already subscribing to podcasts via iTunes, now’s the perfect opportunity to get started and claim a FREE 20-minute voice coaching session. 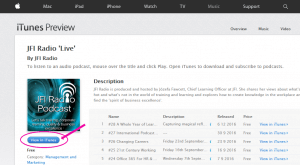 The beauty of using iTunes (and the Podcast app for iOS) is that by subscribing, each time there’s a new episode from JFI Radio ‘LIVE’, you’ll automatically get it! 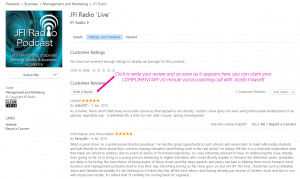 JFI Radio thrives on audience engagement and absolutely loves it if you write a review on iTunes too. Reviews are seen by other people and may help them decide whether to listen to the show or not. 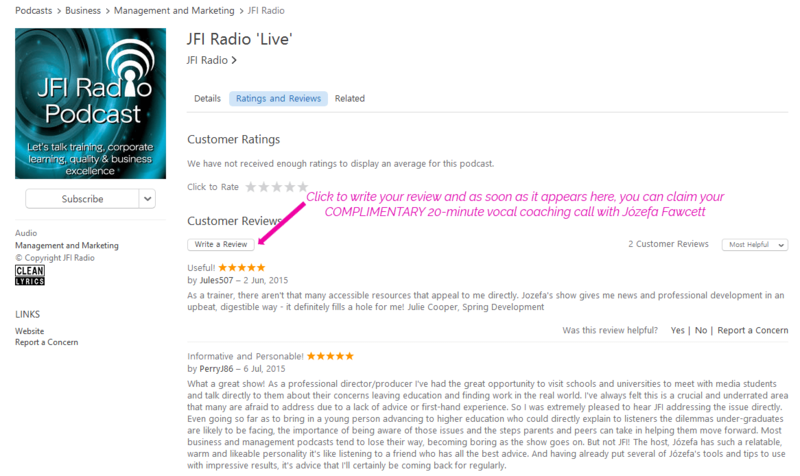 They’re also considered by iTunes and help show ratings, so your review of JFI Radio ‘LIVE’ will mean a great deal! If you’ve never left a review on iTunes before, there’s just a few steps to walk through, so let’s get started! Look for the blue View in iTunes button in the left sidebar and click on that to open iTunes on your computer. 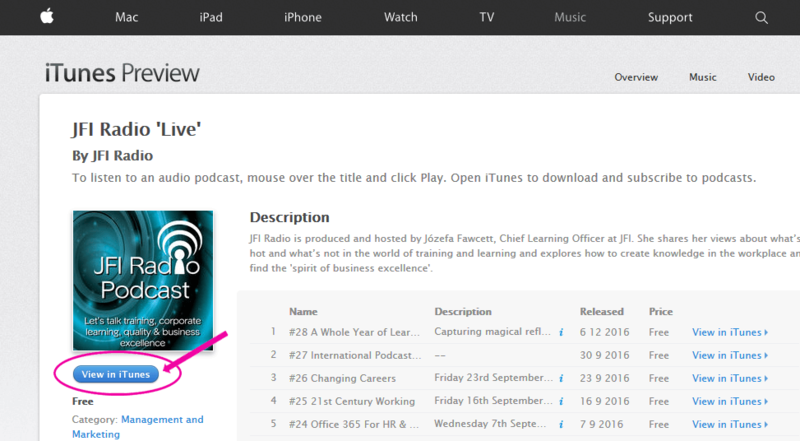 That will open the JFI Radio ‘LIVE’ podcast channel within iTunes. While you’re here, be sure to click on the Subscribe button on the left side just under the JFI Radio ‘LIVE’ graphic. Thanks for that! Next, click on Ratings and Reviews. This will reveal all of the current ratings and reviews that other listeners have so generously left, and provide you with an opportunity to do the same. Above the existing reviews you’ll see a series of stars where you can rate the show from 1 to 5 stars, with 5 stars of course being great! Since you’re logged into your personal iTunes account, Apple will know that rating is from you. Next, click on the Write A Review button. This will bring up a brief pop-up window in which you can type a title and text of your review. If you haven’t already chosen a star rating, you can do so here as well. Write in what you want to say about the show and click on Submit. And that’s it! Apple will review the comment for appropriateness, and then publish it within 24 hours generally. Don’t panic if you don’t see your review immediately, it takes some time. 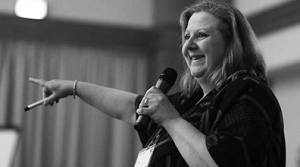 As soon as your review appears, you can claim your COMPLIMENTARY 20-minute vocal coaching call with me, Józefa Fawcett, host of JFI Radio ‘LIVE’, voice-over talent, vocal coach and international double-award winner learning specialist. Note that reviews are limited to 300 words. Also avoid one-word reviews, profanity, comments unrelated to the show, or inserting of links. Reviews with those aspects are likely to not be approved by Apple. Other than approving or disapproving, there is no editing done by Apple on reviews, so also take the time to check your review for appropriate spelling and grammar. Since these reviews are public and associated with your iTunes account name, they reflect as much on you as the show you’re reviewing. Until next time ~ happy learning! …to productivity, quality and change. 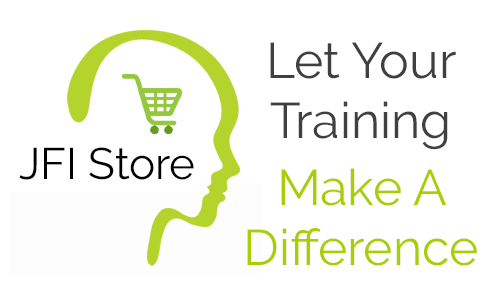 JFI Store specialises in capability development for managers, team leaders, transformational change leads and those who work in HR and Training. We hate waste, whether it’s time or money, so we work hard to maximise your investment in company training and business learning. We’ll feed your talent pipeline and create a workforce with the right mindset to drive forward Industry 4.0 and the digital transformation agenda. …who want to feed their talent pipeline. 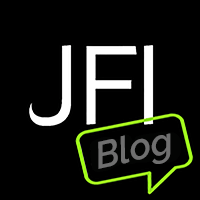 JFI Learning Village ~ for community! Self-learning platform for independent practitioners who want to take charge of their CPD (continuing professional development) and their management and leadership career. A New Year Brings A New Continent – Hola 2019! Copyright © 2002-2019 JFI is the trading name of LearningVoice Ltd. Registered in England nr. 06262217. All rights reserved.